We need a Tor web interface for the DreamPlug, as discussed at the Tor dev meeting in Waterloo, Canada earlier this week. 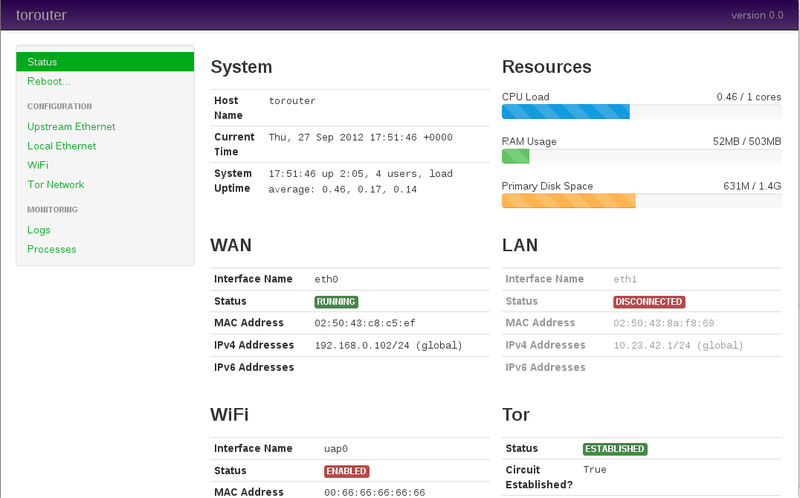 The main page contains an overview of the current status of the Tor router. Status if it is connected properly to Tor or not, and general information on the current status of the network. If it is the first time that the user connects to the Torouter then it loads the wizard. step 1: The user is asked how he will connect to the internet. He chooses DHCP or static or whatever. step 2: The user is asked how to configure his wifi network. ESSID, channel, etc. step 3: He is asked how to configure Tor. .. and so on. As I said I am not sure how you envisioned this. What are your ideas? Sure thing, comments in line. That sounds like a reasonable flow. That sounds like a good start. We need at minimum, a way to set the eth0 interface up, set the eth1 interface as a NAT network or not, run a wifi ap0, etc. I think that we should have a very small web config for tor at this point - arm has the code for verifying config options, we should reuse it. The devices we ship will be pre-configured and ready to go, so I'm wondering if including a wizard will be a bit too much. The devices will be for tech users who know what they are doing, so having a web interface that allows users to change the default config should be enough. The main page can show the status of services such as the Tor bridge, the Tor wifi or the normal wifi, whether or not there are any package updates for the system, if eth0 and eth1 are up, if the firewall is up (and maybe also the firewall rules) etc. I think that showing all of the services listed above on one single page will be messy, so I suggest you pick the most important ones (like the status of the Tor bridge). By default, the device will be using DHCP to connect to the network, Tor will be running as a public bridge, the Tor wireless network will be disabled and the firewall will use some standard rules. At a minimum, we should show the Tor log (n last lines or something like that) on this page. If there are things you can't list on the main page, you might be able to put it here. The configuration options available should be the minimum necessary to get a service up a running; i.e. if you want to configure Tor to do lots of magic stuff, you can, but you'll need to edit the Tor config file manually. This does sound reasonable although I think the wizard would be of value most to a non techie crowd. From what I have seen with home routers, all of them have some sort of guided configuration when you first boot it up. I just wonder if there is a way to make it work out of the box. The items you are saying can surely be displayed. This seems reasonable, although I would not dedicate a whole tab to Firewall or if Firewall has it's own tab so should Wireless imo. Also, is there a git repo with the work you are doing on the Tor router (e.s. config files, init scripts, etc. ) ? There's ​https://gitweb.torproject.org/torouter.git, will that work for you? This is now implemented partially in the torouter-tui package for a basic web UI and by using tor-arm for the text ui. Current torouter-tui is only partially implemented and stale. I'm working on a simple web interface and will take this unless hellais really wants it. A web interface for Tor monitoring would be cool, and it exists: ​https://github.com/ralphwetzel/theonionbox. Closing this as no longer relevant. See also #20747.